It is also one of the most frequented place in Rome: as a matter of fact, it is a meeting place both for tourist and Romans till late in the night thanks, also, to the numerous pubs, restaurants and piano-bars. This square has an elliptic shape like a stadium and, in fact, rises on the ancient Domitian's Stadium. In it you can admire three splendid fountains. 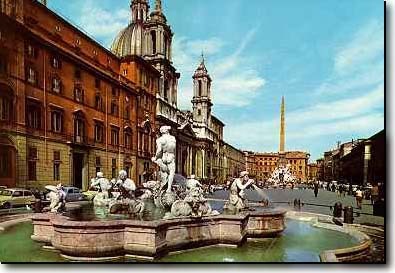 The central one is the Fontana dei Quattro Fiumi which was realized by Gian Lorenzo Bernini and is characterized by four allegorical statues which represent the four main river in the world. The lateral ones are the Fontana del Moro designed by Bernini and the Fontana del Nettuno planned by Giacomo della Porta.. In the middle of the square, there is the beautiful work of Borromini : the Chiesa di Santa Agnese in Agone which has a concave façade and represents a magnificient model of baroque building. Inside, in the crypt, you can admire the remains of the primitive church and the Domitian's Stadium.